Transformation, change, voluntary or involuntary, in either case logical development of existing conditions, yet perhaps sudden and unexpected. Apparent death or destruction, but such interpretation is illusion. The Child of the Great Transformers. Angel with lion’s head, goose’s feet, horse’s tail. Man with 3 heads—a serpent’s, a man’s (having two stars on his brow), and a calf’s. Rides on viper and bears firebrand). A black crane with a sore throat—he flutters. The Child of the Great Transformers. 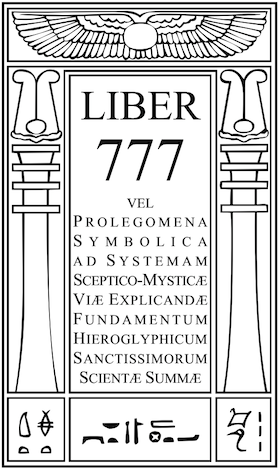 The Lord of the Gate of Death. 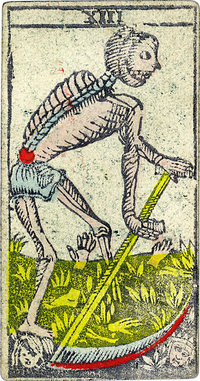 A skeleton with a scythe mowing men. The scythe handle is a Tau.